David had planned to come to the UK from Boston for a family holiday and had asked me to guide his lad Jordan on catching a few fish. Now as you may know most of the angling in the USA is for large and small mouth bass. So when I asked David if he wanted to fish for coarse fish he was slightly puzzled and had to go away and look up what it meant. Sure enough coarse fishing was fine, so with the rivers being closed I opted to fish for tench at Great Somerford. I had caught 9 the previous week when guiding Tyler so why not try again. So I picked them up from the hotel in Bath and headed for the fishery. The day had promised to be mixed in terms of weather and they promised some heavy showers. So I had bought along a fox stalking shelter which in the end proved a wise choice. The first thing was to show them some of the tackle and gear we used. 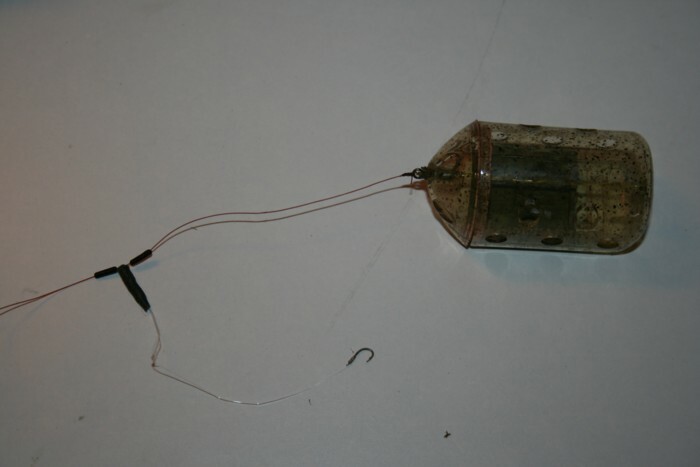 Jordan had a go with the feature finding float and lead, and really enjoyed casting out the spomb. I showed them the reason for clipping up to ensure that the feeder lands at the same distance each cast. So after putting out some hemp we walked around the other 2 lakes to let things settle down. On returning two casts were made and I guess within 20 minutes a tench had taken the bait. The method being used was a swim feeder and the helicopter rig, 5lb hooklink and size 16 hook with 2 or 3 red maggots. This setup was used on both rods. 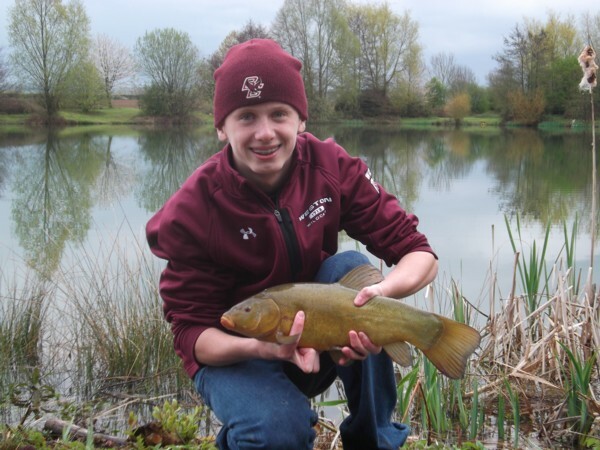 Jordan was used to playing large fish as he is quite successful at bass fishing. 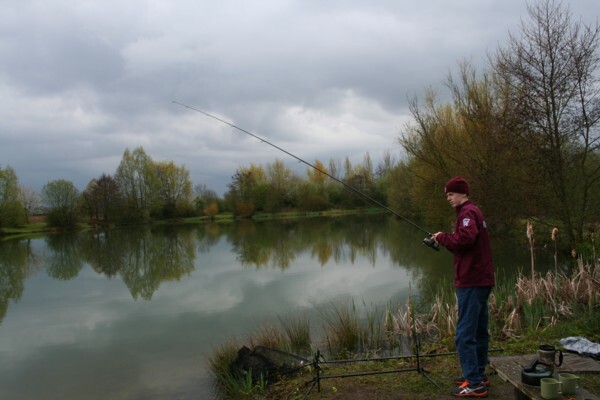 He was very adapt at applying the softer approach at playing tench on fairly light tackle. The drag as they called it was set and changed on a fairly regular basis. The tench came steadily throughout the day together with some good roach to about 1lb plus some rudd to 1lbs 8oz. At one point we had a double hookup and both were playing a fish a piece. The sport ebbed and flowed throughout the afternoon. A thunderstorm passed overhead and I said that in no way would we be picking the carbon rods up if a fish takes the bait. It really is very dangerous. 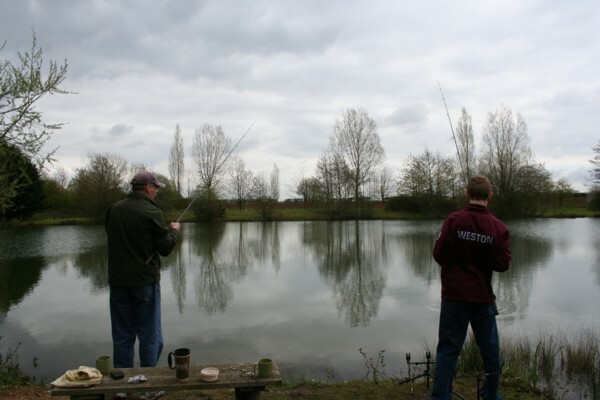 As the storms passed the water surface became flat calm and you could see the tench bubbling and on the feed. And it was as we watched the bubbling over the baited area that the rod roared off again. The tench were not the biggest in the lake however most were around the 4lb mark with the largest going 4lbs 12oz. I took plenty of photo’s of the fish they caught, however mostly on their camera. The reason was at least they could admire the days catch when they returned to the family in Bath. The final tally was 9 tench, 1 small carp some rudd and roach. As 6pm approached it was time to leave the fishery. Jordan and his Dad thought that they would catch one or two fish but didn’t expect the numbers they achieved. Jordan just didn’t want to stop fishing however with the remaining family waiting for dinner reluctantly it was time to go. I hope to include a few more photo’s on here when they email them to me on their return to the USA. This entry was posted on Monday, April 23rd, 2012 at 8:20 pm	and is filed under Uncategorized. You can follow any responses to this entry through the RSS 2.0 feed. Both comments and pings are currently closed.